We are the Storytelling Association of California, a non-profit membership organization dedicated to promoting storytelling as a living art form. SAC has something for everyone! WE HAVE A NEW MAILING ADDRESS! IF YOU ARE A STORYTELLER... Welcome to our community. Browse this site to find storytelling events, classes, workshops, and storytelling festivals in the San Francisco Bay Area, Northern and Southern California. Looking for a place to tell and hear stories? Check out our story swap groups pages for an informal storytelling group near you. IF YOU ARE SEEKING STORYTELLERS for your school, museum, group, organization or event, our members are as diverse as the stars in the sky. Peruse our "Find Storytellers" and contact our members to tell for your next engagement. 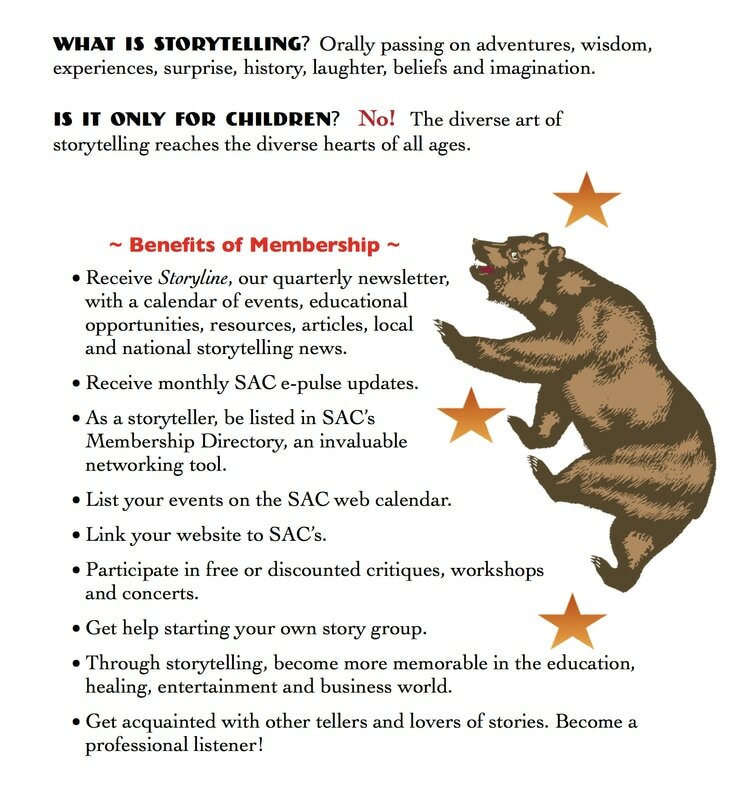 IF YOU ARE A FAN OF STORYTELLING... check out our Calendar of Events, subscribe to Storyline (our quarterly newsletter), and JOIN SAC!!! SAC is Now on Facebook! SAC is Also on Meetup.com! Join Meetup.com and find others with shared interests in your area! New friends and experiences await you. Join the SAC Meetup Group and you will get notices of swap groups that are posting events all around the Bay Area. And if you are a member of SAC and a story swap leader/organizer, you can add your events to our Group -- send an email to Marian Ferrante for details on how to get started.